Folate supplementation reduced the risk for stroke by 18%. A deficiency of folate, vitamin B12 or vitamin B6 may increase blood levels of homocysteine, and folate supplementation has been shown to decrease homocysteine levels and to improve endothelial function . At least one study has linked low dietary folate intake with an increased risk of coronary events. The folic acid fortification program in the U. S. has decreased the prevalence of low levels of folate and high levels of homocysteine in the blood in middle-aged and older adults . Daily consumption of folic-acid fortified breakfast cereal and the use of folic acid supplements has been shown to be an effective strategy for reducing homocysteine concentrations . Evidence supports a role for supplemental folic acid for lowering homocysteine levels, however this does not mean that folic acid supplements will decrease the risk of cardiovascular disease. Clinical intervention trials are underway to determine whether supplementation with folic acid, vitamin B12, and vitamin B6 can lower risk of coronary heart disease. It is premature to recommend folic acid supplementation for the prevention of heart disease until results of ongoing randomized, controlled clinical trials positively link increased folic acid intake with decreased homocysteine levels AND decreased risk of cardiovascular disease. 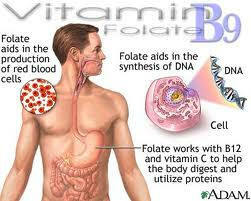 Some evidence associates low blood levels of folate with a greater risk of cancer . Folate is involved in the synthesis, repair, and function of DNA, our genetic map, and there is some evidence that a deficiency of folate can cause damage to DNA that may lead to cancer . Several studies have associated diets low in folate with increased risk of breast, pancreatic, and colon cancer. Over 88,000 women enrolled in the Nurses' Health Study who were free of cancer in 1980 were followed from 1980 through 1994. Researchers found that women ages 55 to 69 years in this study who took multivitamins containing folic acid for more than 15 years had a markedly lower risk of developing colon cancer. Findings from over 14,000 subjects followed for 20 years suggest that men who do not consume alcohol and whose diets provide the recommended intake of folate are less likely to develop colon cancer . However, associations between diet and disease do not indicate a direct cause. Low dose methotrexate is used to treat a wide variety of non-cancerous diseases such as rheumatoid arthritis, lupus, psoriasis, asthma, sarcoidoisis, primary biliary cirrhosis, and inflammatory bowel disease . Low doses of methotrexate can deplete folate stores and cause side effects that are similar to folate deficiency. Both high folate diets and supplemental folic acid may help reduce the toxic side effects of low dose methotrexate without decreasing its effectiveness. Anyone taking low dose methotrexate for the health problems listed above should consult with a physician about the need for a folic acid supplement. Intake of supplemental folic acid should not exceed 1,000 micrograms (μg) per day to prevent folic acid from triggering symptoms of vitamin B12 deficiency . Folic acid supplements can correct the anemia associated with vitamin B12 deficiency. Unfortunately, folic acid will not correct changes in the nervous system that result from vitamin B12 deficiency. Permanent nerve damage can occur if vitamin B12 deficiency is not treated. It is very important for older adults to be aware of the relationship between folic acid and vitamin B12 because they are at greater risk of having a vitamin B12 deficiency. If you are 50 years of age or older, ask your physician to check your B12 status before you take a supplement that contains folic acid. If you are taking a supplement containing folic acid, read the label to make sure it also contains B12 or speak with a physician about the need for a B12 supplement. What is the health risk of too much folic acid? Folate intake from food is not associated with any health risk. The risk of toxicity from folic acid intake from supplements and/or fortified foods is also low. It is a water soluble vitamin, so any excess intake is usually excreted in urine. There is some evidence that high levels of folic acid can provoke seizures in patients taking anti-convulsant medications . Anyone taking such medications should consult with a medical doctor before taking a folic acid supplement.